Completed in 1969 despite the suicide of its architect John Hickman, Century II Convention Center was built to commemorate Wichitas 1970 centennial. 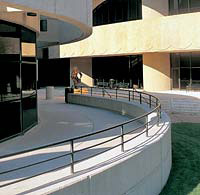 The Center was constructed by the city of Wichita with funding help from the Urban Renewal Agency to provide a large and attractive civic center. The Center replaced the old Forum and other deteriorated business structures along the riverfront. Century II opened its doors for business on January 11, 1969. At the time of its inception, the Center housed Concert Hall, Convention Hall, Exhibition Hall and a theater (which would later be dedicated as Mary Jane Teall Theater on June 29, 1989.) Bob Brown Expo Hall would later be built in 1986. In 1997, the Hyatt Regency Wichita was built and attached to the south end of Century II. There would be other structures and parks developed to complement Century II such as the Garvey Center north of the Center; and to the east, Finlay Ross Park; and to the west, A. Price Woodard Park. Named after Wichitas first and only black mayor, A. Price Woodard Park would improve the riverbank site of the former William Greiffenstein homestead where Indians had camped in the 1870s when meeting with Dutch Bill. The park provides an urban haven of waterfalls and walkways with a view of James Rosatis freeform sculpture Wichita Tripodal.